They have been gathering on my shelves. Every time I do something where I can make “bonus triangles”, I try to make them. I then stick them in a plastic zipper top type bag and throw them in the direction of the others. This is what happened! I decided to pull them all out and take a look at what I had. There are literally thousands of these things here! So I’d better start thinking about them. But how would you handle these? I think the first thing is to break them down into sizes. It’s not going to be quick. 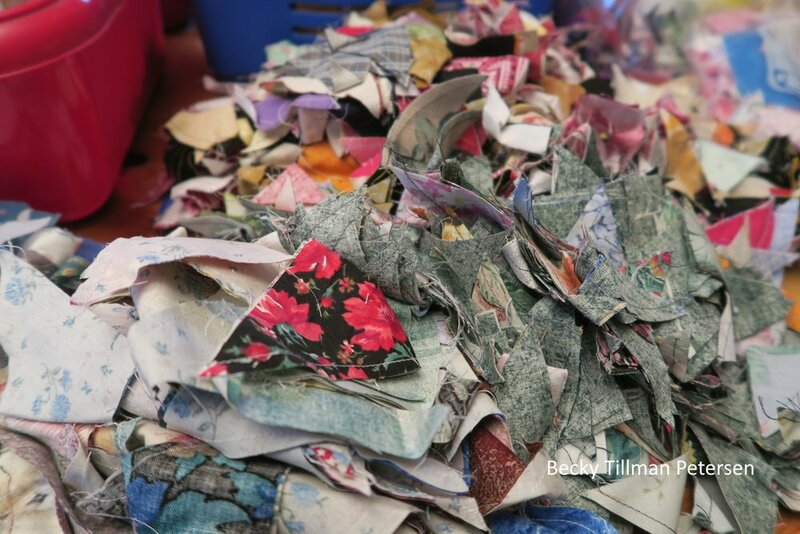 Today I spent an hour simply sorting - SORTING - not cutting, pressing or anything. I don’t feel like I made a lot of progress. But you’ve got to start before you can finish. So start I did. Here’s everything I’ve got - from sheets of HST already sewn but not yet trimmed (I made too many) to ready to go. Most are not ready to go - they are simply two triangles sewn together . I need to press them open, measure, trim and then I can march on. But now I want to get going on them as I have an idea - and then I’ll probably make up some blocks incorporating these already made up blocks maybe combined with other 2” strips. I have a lot of those still. I will probably start with the larger ones - and work my way down to the smaller ones - hoping for more inspiration as I go. I really do not want to do a series about triangles, but I may try to purposely work these into my other quilts in the near future! That’s at least one of the things I’ve been working on! And yes, I heard from the repair place for my big sewing machines - they should be on their way back to me on Monday or Tuesday! Be sure to check out what my sis has for you in the store! If you are too late for THIS Christmas, you can always be ahead for next!